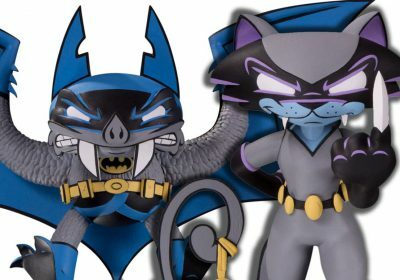 Continuing to create art figures, something his character-based work seems suited for, Luke Chueh (interviewed) recently released a 5 inch “Wannabe” Flocked Dunny. 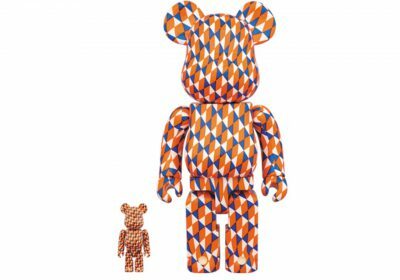 Reprising Kidrobot’s most iconic platform toy, the Los Angeles-based artist reworked the sculpt into a version of his famous “possessed” bear with knife. 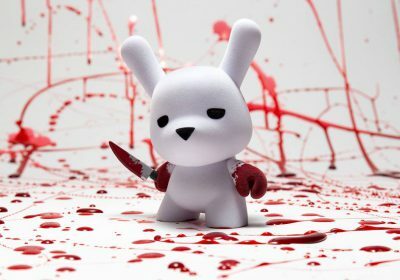 Mixing the cute with the macabre with Chueh’s signature dark humor, the dunny comes in a generous edition of 1500 and can be purchased here for $55. 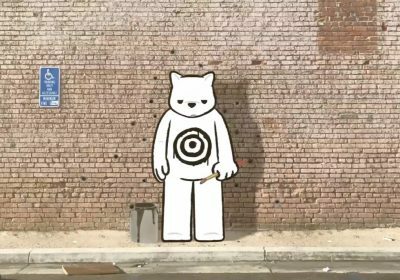 Discuss Luke Chueh here. 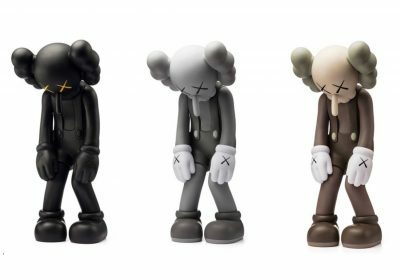 After dropping hints on Instagram for the last few weeks, KAWS is ready to finally release his SMALL LIE figures. 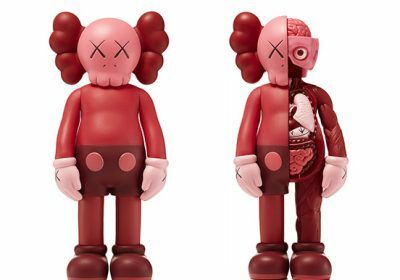 This new sculptural limited edition features his popular companion figure (a remix of Mickey Mouse with a skull and crossbones head), with the addition of a Pinocchio nose. The figure will be produced in the usual Black, Grey, and Brown colorways and will be available tomorrow at noon EST on the Brooklyn-based artist’s website. Discuss KAWS here. 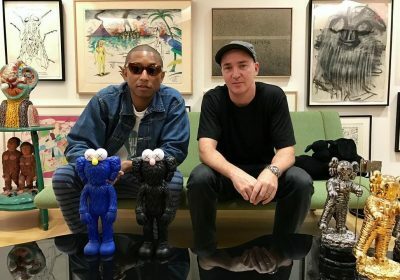 Following up the unveiling of his BFF statue in Bangkok last year (covered), as well as plush versions in blue and black, KAWS will be releasing vinyl versions of the figure tomorrow (October 18th). 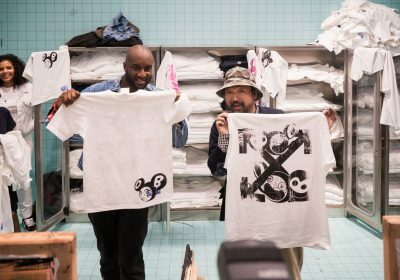 The blue version can be purchased starting at 10 AM EST online at MoMA and at its two NYC shops while the black iteration will be available on KAWSONE.com starting at 12 PM EST. These are mostly likely open editions. Images via Hypebeast. 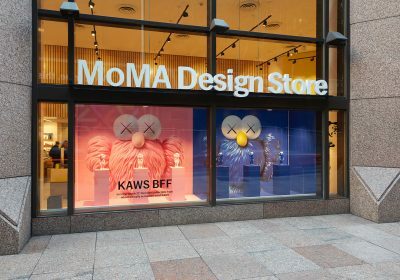 Discuss KAWS here. 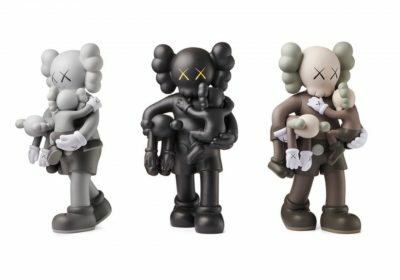 Just released this morning, the Blush edition of KAWS’ Companion figure is still available on his website. The two versions (regular and flayed) are both open editions and retail for $200 each. If you remember, word on these first surfaced around the time the Brooklyn-based artist opened his show in Shanghai. Discuss KAWS here.